(Trent Nelson | The Salt Lake Tribune) Director Mitch Davis speaks at a news conference announcing release plans for "Other Side of Heaven 2: Fire of Faith," based on real-life mission president experiences of John Groberg, emeritus General Authority for The Church of Jesus Christ of Latter-day Saints, in Salt Lake City on Wednesday April 10, 2019. 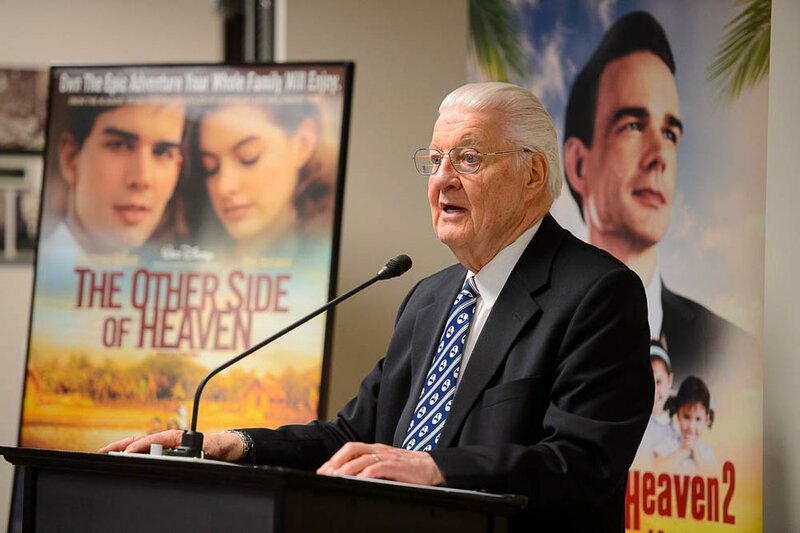 Filmmaker Mitch Davis has big plans for his new movie, a sequel to his 2001 film “The Other Side of Heaven” — one of the few movies about members of The Church of Jesus Christ of Latter-day Saints that received worldwide distribution. 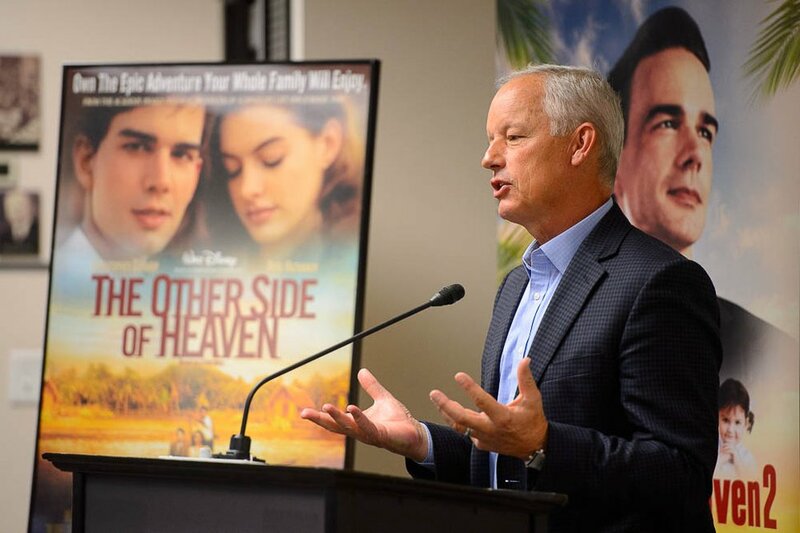 Davis, in touting the upcoming “The Other Side of Heaven 2: Fire of Faith” at a news conference Wednesday, said that when it comes to stories of faith, filmmakers have to go big or go home. The 2001 film was based on the young missionary adventures of John H. Groberg, now an emeritus general authority in the Latter-day Saint faith, who served in Tonga in the 1950s. The new movie shows Groberg (played, as in the original, by Christopher Gorham) as a family man, with his wife, Jean, and their children, returning to Tonga as a mission president. The new movie is set to be released on between 200 and 300 screens nationwide on Friday, June 28. The date is sandwiched between two summer blockbusters: Pixar’s “Toy Story 4” opens the Friday before, and the Marvel superhero movie “Spider-Man: Far From Home” will dominate the Independence Day weekend the week after. To help lay the groundwork for the new movie, the original will make a return engagement in three Utah theaters — the Megaplex Theatres at Vineyard (Provo), Thanksgiving Point (Lehi) and Legacy Crossing (Centerville) — for one week, starting May 17. Also, BYUtv — the cable channel owned by the church — has signed on to screen “The Other Side of Heaven” on back-to-back nights, Sunday, June 23, and Monday, June 24. (Trent Nelson | The Salt Lake Tribune) Michael Dunn, new managing director of BYU Broadcasting, speaks at a news conference announcing release plans for "Other Side of Heaven 2: Fire of Faith," based on real-life mission president experiences of John Groberg, emeritus General Authority for The Church of Jesus Christ of Latter-day Saints, in Salt Lake City on Wednesday April 10, 2019. The original “Other Side of Heaven” played on 334 screens nationally and made $4.7 million at the box office in 2001, equivalent to about $7.5 million in today’s dollars, Davis said. It then went on to sell 4 million DVDs, supported by Walt Disney’s home entertainment arm. (Photo courtesy of 3Mark Entertainment) Christopher Gorhan, right, and Joe Falua in a scene from the 2001 film "The Other Side of Heaven." Both will reprise their roles in a sequel, set for release on June 28, 2019. “The Disney brand didn’t hurt us, and Anne Hathaway’s face helped us,” Davis said. 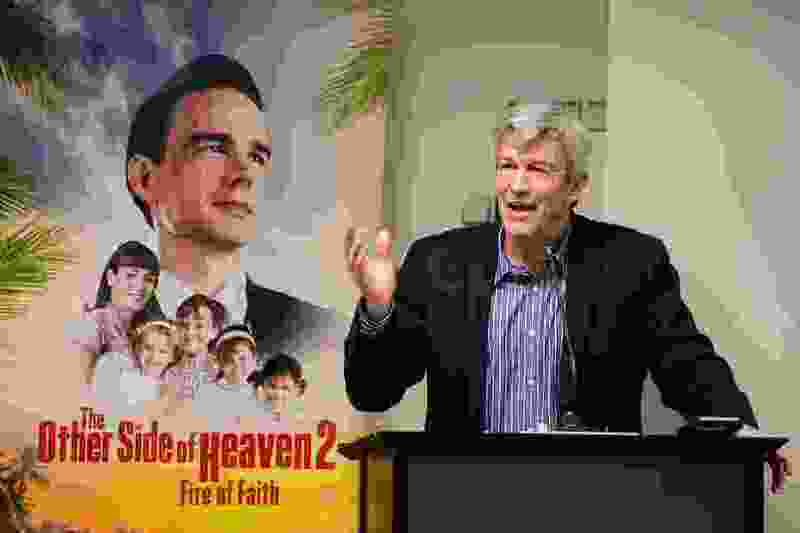 That success, Davis said, meant “The Other Side of Heaven” attracted international distribution, something most movies with Latter-day Saint themes don’t get. It played in nearly every majority-Muslim country in the world, he said, and was bootlegged in China. For years, Davis resisted calls to make a sequel, in part because he didn’t think he could replicate the scope of the original. “I didn’t want to make a 10-cent movie, and besmirch or diminish Elder Groberg’s story by making it small,” Davis said. (Lauren Smith | courtesy Excel Entertainment) Christopher Gorham returns as John H. Groberg, who goes back to Tonga as a mission president for The Church of Jesus Christ of Latter-day Saints, in the drama "The Other Side of Heaven 2: Fire of Faith," which is set to open in theaters nationwide on June 28, 2019. Davis would only say the budget is in the seven figures, but said filming in Fiji, with a generous 47% production incentive, stretched their dollars further. The production used local crews from New Zealand and nearby Pacific Islands, and reunited many of the local cast members from the first film. Davis said he hopes the Latter-day Saint audience in the United States will be “the slingshot” to propel the sequel to a global audience. Groberg, now 84, is more sure of the movie’s success. (Trent Nelson | The Salt Lake Tribune) John Groberg, emeritus general guthority for The Church of Jesus Christ of Latter-day Saints, speaks at a news conference announcing release plans for "Other Side of Heaven 2: Fire of Faith," based on Groberg's real-life mission president experiences, in Salt Lake City on Wednesday April 10, 2019.